When asked “How long does gout last?” most people would say, "Too long!" The real answer: It depends on three considerations that can contribute to a gout attack's duration. How long does gout last? Your symptoms, treatment, and diet all come into play. Gout attacks quickly, usually at night and most often in your big toe. The pain heightens about eight to 12 hours after onset. 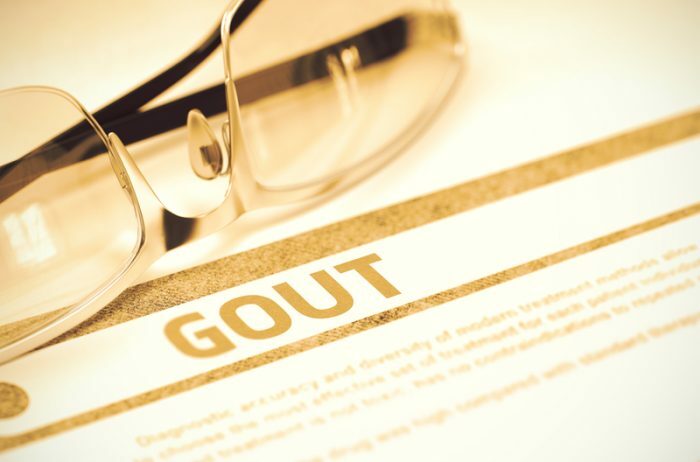 Gout symptoms can be extremely painful, and the first 24 hours are usually the worst. A gout attack typically lasts three to 10 days. However, the answer to the common question “How long does gout last?” is more complicated. Remember that your gout problem has actually been brewing for quite some time, possibly years. Gout is caused by uric acid buildup in the blood. Uric acid is a waste product normally eliminated from your body by your kidneys. When your kidneys aren’t fully functioning and/or your body is producing too much uric acid for the kidneys to keep up, excess uric acid in the blood can become hard crystals that attach to joints and tendons, setting the stage for inflammation and painful gout. With that in mind, answering the question “How long does gout last?” depends on three main factors. First, you need to know how to define gout, which means you need to see a doctor, at least for the first attack. Gout symptoms—swelling of the joint, inflammation, redness, and sore skin—can be associated with other diseases, too. 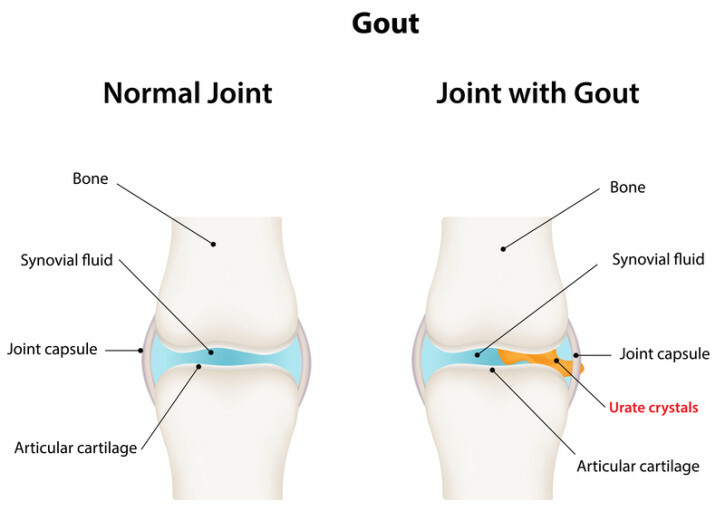 If gout sounds a lot like arthritis, you’re right. Gout is a form of arthritis in that it’s an inflammation of the joints. And like arthritis, the real answer to “How long does gout last?” is, unfortunately, a lifetime. The good news is that medications and diet can make a difference in gout’s severity and frequency. With treatment, individual episodes of a gout attack will be fewer and the length and severity lessened. Some gout sufferers never have a second episode. But untreated, gout will likely return. Second, you can usually alleviate gout symptoms at home. The medicines your doctor prescribes are important in controlling gout over the long run, but once gout appears, your goal will be to ride it out via treatment and diet. It also helps to rest the joint as much as possible, applying cold packs as needed. Sometimes it’s even painful to wear a sock, so some gout sufferers cut a hole in the big toe area of their socks. You should drink plenty of fluids—staying hydrated is important. And over-the-counter NSAIDs (non-steroidal anti-inflammatory drug), like ibuprofen, can help ease the pain. Third, with or without medicine, you have to change your diet in order to lessen the number and severity of attacks. Learn which items in your diet cause flare-ups, and avoid foods that cause gout. Most gout patients would agree that avoiding foods that cause gout is far easier than enduring another flare up. That “avoid” list might make you wonder what you can eat. Safe “gout food” selections probably won’t surprise you: vegetables, low-fat dairy, cherries, and high-fiber carbohydrates are among the items that can help you avoid gout pain. add, alcohol, anti inflammatory, arthritis, beer, dairy, dash diet, diet, fiber, fiber carbohydrates, food, foods that cause gout, foods to avoid, foods to avoid with gout, gout, gout attack, gout attacks, gout diet, gout foods, gout is caused by, gout pain, gout remedies, gout symptoms, gout treatment, how long does gout last, inflammation, inflammation of the joints, information on gout, joint inflammation, low fat dairy, nsaids, pain, skin, uric acid, vegetables, what is gout. Lasts three to ten days?! Then why am I on day 20? Steve, I just had my first attack, very scary. Typical big toe left foot. The whole foot swelled. Worst pain, like can I please remove my toe type was about like what this article stated. My doctor said “I think it’s gout, take Alieve once a day for a week” and sent me home. I have stage three kidney disease because of Viet Nam. I am 69, 5’5, 160lbs and still working so must be careful with drugs. My friend, it is day 30, my foot still swells worse in the evening like walking on a puffed balloon, can move the joint now but still use a cane for the one mile walk to my car each day. I quit meat and other advised to quit foods, am a non-drinker and smoker, took up cherry juice and think I might be very slowly improving. I want to dance again with my wife. I don’t know if my foot will be normal again. If it ever is, it’s rabbit food for life for me. 3/10 days is indeed completely false – probably the initial attack yes, but I’m still suffering with swelling and pain twinges over 7 weeks after…. My first episode lasted 3-4 weeks. That was 15 years ago. Only one attack in the last 5 years thanks to a small dosage of allopurinol. My advice on feeling the niggle of an attack it to take the meds (NSAIDs or colchicine) immediately – the inflammation that causes the pain is caused by your bodies immune system attack the crystals, which isn’t in fact helpful and can cause a self-reinforcing loop. For me the triggers seem to be heat and exercise. Presumably due to de-hydration and weight loss (your own flesh is high in purines which convert into uric acid and crystallize to form gout). I’m quite fit ( not overweight) and otherwise healthy. I’m 61first flare I had I ended in the emergency room, that’s when I found out I had Zulu gout in the knee worst pain ever I wanted my leg amputated pain was so bad after seven days I went to work with a limp but 3 days later I got flare up again very painful couldn’t afford emergency room again 250.00 deductible. I’m better now not my leg is still swollen even with medication. I need crushed to walk can’t go to work till swelling goes down it’s been 5 day’s now. Watching what I eat. got my first gout in my 30s and was free of gout until my mid 70s. Then I got it once in year 2016 and twice in 2017and twice in 2018. No medicine until 2018 but that only helped for about 3 weeks. I’ll stick to water and dietary supplements for now. Hope I never get it again!!! I am on my 70th day of a severe gout attack. I have tried four different type of medicines. I eat no red meat, shells or purine rich food. I do not drink alcohol at all. I tried vitamin C supplement since one week, apple vinegar, Bicarbonate sodium, but still suffering light swelling and pain in many joints of my right foot and much less in left one. I hope the attack will not come back after two days when I finish colchicine pills as it did when I stopped other medicines. I would like to mention that I was suffering vitamin d deficiency since one and half year, but I started to feel better only the last two or three months. I’m having my second attack and I’m only 27! I Don’t drink alcohol, eat much meat or overweight. On day 20 of this attack and I’m getting rather annoyed. Gout doesn’t run in my family and I have no other illnesses. Doesn’t seem that fair. I am sorry to read about the pain you all are experiencing, but it has helped me to understand the pain that I continue to experience. Thank you for sharing. I am 65 and this is my first gout experience. It is in my toe and foot and although the swelling, redness, and hugely intense pain lessened after 5 weeks…I still cannot walk and get stabbing pains in my toe and cannot wear shoes except for Fitkicks – hard to dress for work 😉 So it looks like all the articles I have been reading about the duration are not correct 🙁 Hope everyone gets better soon. I am 61 and just got my first acute attack on Tuesday in my ankle Started prednisones immediately felt slightly better then called my doctor and got colchicine. Next morning felt “almost cured”. Friday afternoon, wham, it’s back in full revenge. Continuing low dose colchicine and steroids and getting better slowly. Update from July 2018. 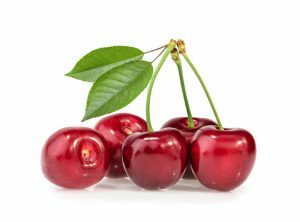 No medication from start, just about six swallows of tart cherry juice in the morning, 500mg per day C tabs and tough diet this article recommends. As healing progressed, went through puffy sensitive to touch toe till Oct.23rd. Used oversized shoe with arch support and doubled up socks to walk. Now November 5th 130 days later, no pain, swelling gone and back in my dance shoes. Checked with my doctor, lost weight, stayed on this articles diet and slowly increased walking to keep blood circulating. I’d say don’t cheat on the diet. Most here say it comes back. I’m 52 fairly active and overweight. Had an attack Nov 18 & today Dec 3rd. Walking much better, swelling down and pain free. I also have been working since the second week of the attack. What I did was I got prescribed colchicine ( just 1.8mg) once then I flushed myself with drinking at least half a gallon of water everyday. Had celery as my snacks and restarted fish oil supplements. I’m not a doctor but this remedies worked for me. I hope your pains go away and keep the site rested and elevated as much as possible. I’m glad i found this thread as i was starting to think i had something other than gout because it’s been about 4 weeks, 5 visits to the doctor and lot’s of medication and i’m still in pain (although it started to get better a few days ago, but today i’m back to being stuck in bed). Medication doesn’t seem to work very well for me. I took colchicine for 5 days which did nothing, then 30mg of prednisolone for 5 days, then 15mg for 5 days and now down to 5mg for 5 days. I’m 42 years old, don’t smoke, have a beer once a week, pretty fit, but i have been eating quite a bit of red meat lately and over the Christmas break. I had gout a couple of years ago too but it didn’t last this long. I’ve been drinking about 3 litres of water each day to help flush it out. The doctor said he can’t take a sample of the fluid in the joint because it’s in a tricky spot (big toe) so just relying on the uric acid level in blood. So bloody boring being stuck in bed! I was diagnosed as having my first gout attack in my right big toe area and foot on December 13, 2018. Twenty-five days later, I’m still experiencing swelling (especially at night), big toe joint stiffness and a dull ache that mostly is felt when stretching the toe joint or pressing around the toe area. I regrettably did not seek any medical attention until one week after the flare up and at that time my doctor prescribed Indomethacin 50 mg twice a day for pain and swelling and it worked very well. My doctor also prescribed Allopurinol 100 mg to be taken once a day, but he was adamant in explaining that I should not begin taking this drug until my pain and swelling fully subsided cautioning that doing so could cause my flare-up to worsen. I think I have also read this in my research on gout medications, but I would be curious to know if this is consistent with what others here have heard from their doctors, so please let me know. I have cut about 90% of my alcohol consumption since my initial flare-up, but have “cheated” a little with two martinis between Christmas and New Year’s Eve and four glasses of red wine with meals over the past 25 days while greatly upping my water intake. While I know I’m healthier reducing my alcohol intake, I’ve not seen any direct difference that I can tell one way or the other when I’ve enjoyed that infrequent (wonderful) martini or glass of wine. Sorry for this rambling comment and glad I found this forum. Nice to know I’m not that much of an outlier still experiencing symptoms almost four weeks into first flare up. Good luck to all of us! I started having gout attacks 5 years ago after knee replacement and the attacks are getting worse lasting longer totally unbearable. I can’t take the pain meds recommended due to heart meds. The attacks seem to come when I stop one heart med and or start a new one which is often. I watch diet carefully and drink gallons of water daily. How many days should I take colchicine? Hello everyone I’m 51 years old and was diagnosed with Gout when I turned 32. I’ve had it in my big toe, ankle and elbow. Yet still the most painful place that I have experienced an attack is the knee. It is so much more painful to me as most of the body’s lower movement comes with bending the knee. Anyways January 12, 2018 and was prescribed 30 pills of Indomethacin. Today is January 21, 2018 and I am feeling so much better. My wife also stopped by the market and picked me up a bottle of 100% tart cherry juice. with rest and keeping your leg elevated and a ice pack; I’m telling anyone that it works but you have to stay off of the leg/foot and keep it elevated. You can also take/substitute the Ibuprofen liquid gels along with your prescription of Indomethacin/NSAID so that you don’t run out of your prescription during the attack. Yes it’s true you can get rid of that mean old Gout Monster with in 7 to 10 days but remember you have to elevate the area and stay off of it. And yes he is the Gout Monster. Although everything doesn’t work for everybody but this method truly works for me. I hope that everyone can find relief from the Gout Monster. Be Well. Hi everyone, i’ve been suffering with gout attacks for about 5 years. The toe next to my large toe, ankle, elbow and now my knee. Mostly i get an attack following Christmas which is the case right now with my right knee. I don’t normally consume a lot of sugar except for Christmas e.g egg nog with rum, chocolates, pie and sweets. Also i try to drink 6-8 500ml bottles of water a day to keep my urine fairly clear. If i don’t drink a lot of water my urine goes orangey colured and WHAMO….another attack. If i just follow those 2 guidelines, no sugar and lots of water, i’m usually gout free. Next year i’m going to refrain from all the goodies and alcohol and be more vigilante with drinking lots of water every day. I hope this helps and good luck everyone! I am glad I found this site and read all the comments, I am on day 34, however that number is somewhat not right. I got my attach on Dec 27th 2018 after having ribeye two days in a row and some apple cider beer (alot of sugar in that beer). I thought I hurt my toe from biking riding and wearing a new pair of boots when I did some yard work around the house. So for the next 10 days I was still eating red meat, some shrimp and drinking about 1 beer each night, while at a wedding and on vaca in Cali. My toe was killing me so the vaca was not a great vaca. When I got home from Cali, on Jan 8th, I saw the doctor and blood level was at an 8.5. So he said I got gout. Back in Dec 2016, when I had my 1st attack, they said level was at 6.5 so that doctor thought it is not gout and though I hurt my toe from biking riding. This is why when it happened again in Dec 2018, I thought it was not gout, which was a big mistake on my part. I was having an gout attack and I was still eating red meat, beer, sugars. Each day I was waking up still not getting better. Since Jan 8th and I have started to drink alot of water (about 4 liters a day). So on day 20 (from Jan 8th to Jan 29th). I can walk slowly, still small amount of swelling. I do not like to take meds, but if I want to swelling to go down I take indomethacin or adval. start cherry tart pills with celery seed extract, Vit C, apple cider vinegar pills. These pills might help you. You need to test the pills to see if it helps you. Once attack is gone, and you are back to normal, continue to eat healthy, drink alot of water, introduce small amounts of light beer and red meat. (mabe 1 beer a week, one small red meat meal a week not on the same day) and see how it goes. Also get to a healthy weight, get rid of your large belly if you have one. Your wife will love it. I have gout on my right great toe and been taking Colchicine and alpurinol for past 3weeks now. I usually eat good. I don’t drink alcohol nor much red meat. But I don’t drink much water which I now understand H2O is quiet important. I have modified my food table even further and the pain still comes and goes. I lost so many days of work from this monster gout and I hope it does not come back. When I spoke to a podiatrist he said apply heat instead of Ice and he told me Uric acid melts or decimates better with heat like sugar and water dissolve better with warm water than ice water. I wish everyone pain free life and walking again. I missed my poor toe. Sorry for the long post. I am now 30 years old and have been experiencing gout attacks for 3 years. I am fit and exercise about 3-4 days a week regularly and do a lot of hiking during summers. I am a Vegetarian, so Fish/redmeat were ruled out of my possible gout triggers. I usually get my attack once a year during summer, i guess because of the excess heat here, combined with lesser water intake and higher intake of beer and other alcohol. Reduce alcohol consumption to once a month. Absolutely no excuses. Probably skip a month for an extra drinking day during holidays. Goal is to go gout attack free for the coming year. Lets hope it works. I had an attack once about 4 years ago, it lasted a few days and I thought it was originally a basketball injury or something. In reality I was a bit dehydrated from summer activity and simultaneously enjoyed a bunch of shrimp and beer at a BBQ. Once in a while my toe felt little pangs now and then, but nothing close to an attack. And again I was playing sports so the joint pains from normal activity were not uncommon and feel similar. Fast forward to this past holiday season. I had a full fledged gout attack kick in on Christmas Eve out of nowhere. It’s March 15 and the joint still hurts. While the swelling has gone way down it still threatens to come back and hurts tonight. Have been on colchicine but had to stop b/c it was throwing my liver values way high, and am now on allopurinol w/o the support of colchicine, which makes it more likely I may have a repeat attack over the coming couple of months. It hurts tonight an my serum uric acid level is only 5.2. I’m 45, was healthy, athletic, no family history of gout. It’s baffling and surprising that such a common, painful condition doesn’t have a more effective evidence-based treatment. I am 43 . When I had 1st attack I did not know that it’s a gout attack. After three weeks I went through medical examinations. I found the uric acid was 8.44 . It was high. I wan an alcoholic stop drinking. I have been drinking loads of water and taking medicine but still after almost 6 week pain is there. Inflation and swelling is not going at all. Preying to get rid of it soon. Being a cricket coach I am not able to work.